Lucky me. I seem to hit New York City at its most memorable extremes. My previous trip was February 2007 and there was a blizzard. I was wearing heavy boots, dressing in layers and leaping over mountains of snow at each curbside. On this recent trip, by contrast, I was treated to a heatwave, 95 degrees at least during my last couple of days in the city, and you can add about 10 degrees thanks to radiating heat from the buildings and streets. I was seriously looking forward to returning to Seattle’s October-in-June weather. The Seattle Times homepage welcomed me home last week with a headline that noted Seattle’s temperatures as lower than those in Siberia. Enough about the weather. My 5 days in the Big Apple were great, nonetheless. The original reason was to attend the red-carpet-and-black-tie James Beard Foundation Awards last Sunday night. The ceremony and following food fest were held at Avery Fisher Hall at Lincoln Center. Lots of wow power just with the venue, and that’s before you consider all the luminaries around you: from uber-chef Thomas Keller to the doyenne of cookbook editors Judith Jones. MCing the awards was the food world’s Bobby Flay and the celeb world’s Kim Catrall. The Beard web site has all the details of the winners, but of particular interest to me were Holly Johnson’s award for best chef in the Northwest (well-deserved and long overdue) and the fact that Tom Douglas did not win (yet) for best restaurateur in the country. I hope soon to say “well deserved and long overdue” about him winning that honor as well. I don’t have the stamina that I used to when it comes to eating marathons on trips like this. The extreme heat certainly didn’t help. Lots of my food friends who were also in town were hitting top spots for lunch, checking out two or three others for a progressive dinner, with wee-hour nibbles at yet another must-go or two. A couple places folks raved about were Prune and Eleven Madison Park (the latter I went to on that blizzardy trip last year, it was out of this world). The one “hot-spot” I went to with a group of friends was WD-50, one of the more avant-guard restaurants in town. Interesting, but it didn’t float my boat. 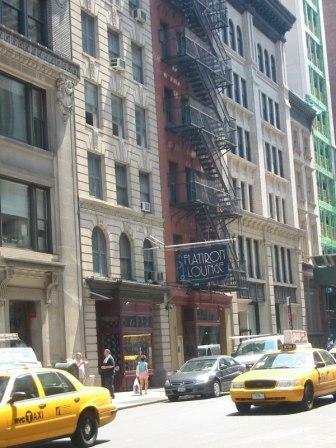 A favorite bar stop from last year’s trip was the Flatiron Lounge, which I only got to walk by pre-cocktail hour this trip. My welcome-to-New-York dinner the first night (with longtime pal and best drinking buddy Jack Robertiello) was at 81, the new restaurant opened by Ed Brown. 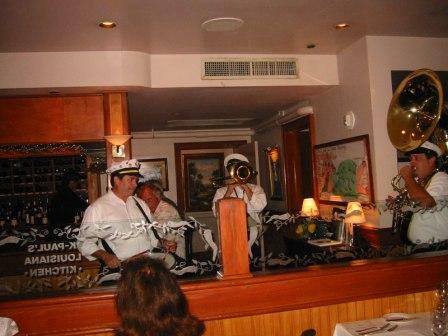 He’d long been the chef at SeaGrill in Rockefeller Center, I know him from way back in Simply Seafood days. Really great meal, loved the pea and fava bean soup, served with a crab fritter. I know he can cook fish like a dream (Jack was impressed with his cod entree) but I opted for the lamb, served with favas, artichokes, braised greens, fiddlehead ferns. Really outstanding. Great start to the visit. 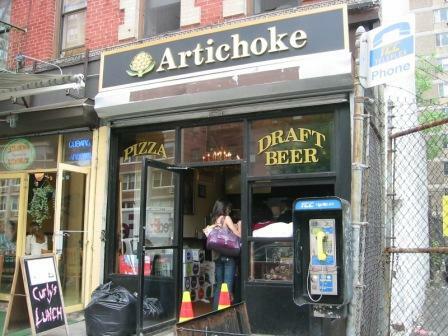 At the other end of the culinary spectrum, another pilgrimage was to Artichoke Basille’s Pizza & Brewery on East 14th, which I learned about thanks to my New York Magazine subscription. Lines are a regular thing here, not only because the place is so popular, but because it’s so small: room enough for maybe six salivating patrons in the tiny space, the rest spilling out onto the street. While I was at the end of the line, a local asked me “what’s up with this place, last night the line was all the way down the sidewalk,” she said, waving her arm up toward 2nd Avenue. Feeling suddenly the insider, I told her that I knew their pizzas to be outstanding. 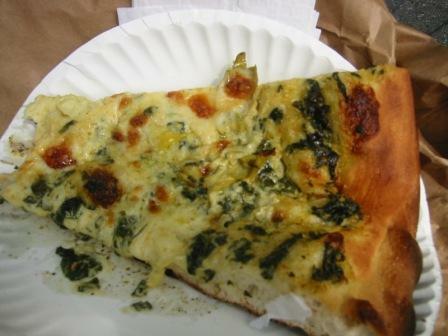 I took my large slice of their signature artichoke (it’s a very simple operation, just a couple of options available) to a park bench in Union Square and had a perfect Manhattan lunch, complete with repose from the heat and plenty of people-watching. There is so much more to tell about that trip, but I’ll save other tidbits for another time. Just can’t pass up this last shot, however. I was early for a lunch appointment in the West Village and slipped into The Grey Dog’s Coffee on Carmine Street for an obligatory iced coffee (a wonderful hang-out and casual lunch spot). I was checking email, making notes, etc., barely noticing the tabletop. At first, when I thought I saw something familiar out the corner of my eye, I figured it was brain-fry from the heat making me see things. 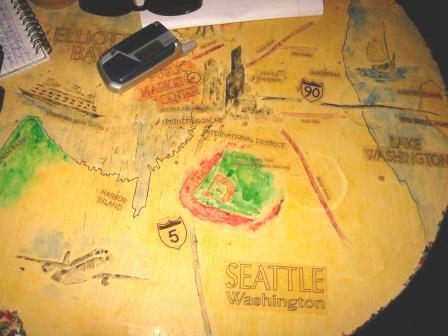 But I cleared away my phone, notepad and map to find that I’d chosen the Seattle table, complete with Boeing jet and sailboats on Lake Washington. It was almost like a cool Puget Sound breeze on an incredibly hot New York day. It’s a great city to visit, New York. But I’m very happy to be home. I just got a press release from Food & Wine Magazine announcing the 2008 winners of their coveted “Best New Chef” recognition. Of course, I’m always thrilled when Seattle chefs gain recognition nationally. 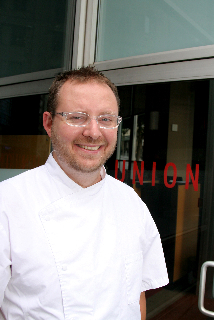 An ovation goes out to Ethan Stowell, chef/owner of Union, Tavolata and the new How to Cook a Wolf for being so honored this year. Woo-hoo!!! The ten winners are being fêted tonight in New York City. That explains why Ethan could so easily make an appearance on today’s episode of Today (as I learned from Nancy Leson’s blog this morning, too late to try to catch the spot). Sorry to say that I haven’t been to any of the other award-winners. 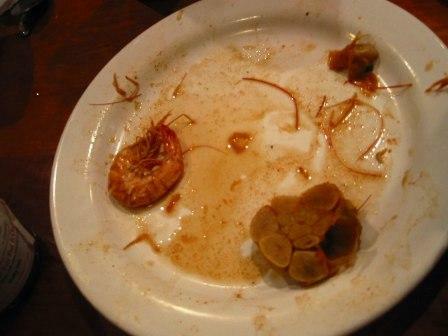 But I can try to make it to Gautreau’s in New Orleans in a couple of weeks to sample some of Sue Zemanick’s creations. Past F&W “Best New” winners in our neighborhood include Jason Wilson at Crush (2006), John Sundstom at Lark (2001), and Maria Hines at Tilth (2005). And we’ve inherited a couple: Danielle Custer won in 1998 while she was cooking in Dallas (she’s now general manager at Taste at SAM) and new chef at The Herbfarm, Keith Luce, won in 1997 while in Chicago at Spruce. Oh, and just to keep the kudos coming, I’m late in sending out three cheers to Maria for her inclusion on Frank Bruni’s recent list of ten “Intriguing New Restaurants Outside of New York” in The New York Times. Outstanding news, bravo Maria! I have been to one other on that list, Central, which I reported about in an earlier post about our trip to DC (keyword: banana split). 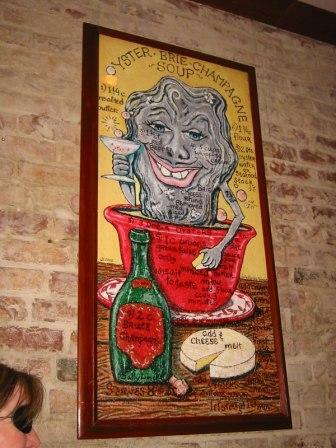 And one I will definitely be visiting on my New Orleans trip: Cochon. 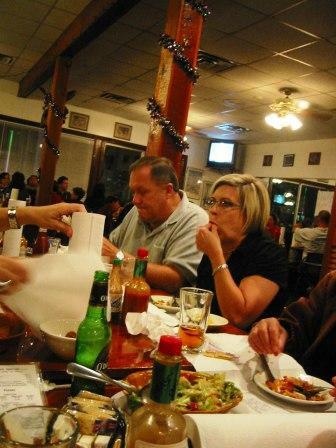 So excited about that dinner, gathering with a number of IACP friends before the big conference begins mid month. This will be one of those “a picture is [hopefully] worth a thousand words” posts. Although unfortunately, you end up getting nearly a thousand words as well. My little digital camera must have been near capacity when we got home last week from five days in Washington D.C. 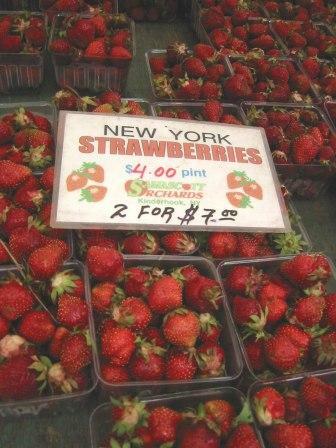 I can’t resist sharing some of the favorite sites and best bites of the week. 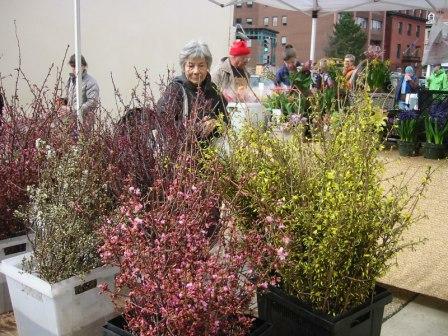 We hit the Dupont Circle farmers market on Sunday, which was a big treat. This proved to be some of the most springy color we saw all week! A bit early for all the blossoms. I was thrilled to find YARN for sale at this market. And yes, I bought a bunch. Sunday afternoon we spent time visiting a few of the monuments in town. I’d never been to the Lincoln Memorial, which is really impressive and moving. 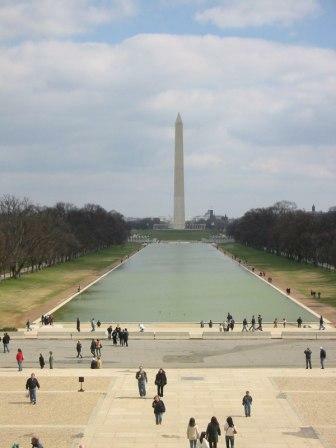 This is the view from the steps, looking back down the mall toward the Washington Monument. We spent a few hours in the Natural History Museum, particularly enthralled by the amazing stones, minerals and gems. There is a special butterfly exhibit there now, including a live butterfly pavilion (which requires advance tickets and timed entry). It was amazing. 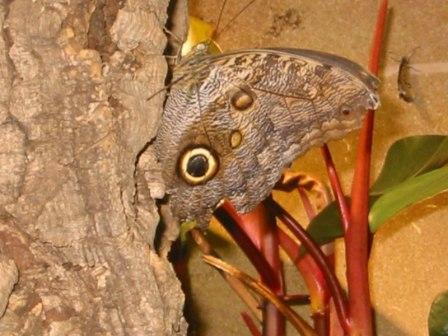 This butterfly really grabbed my attention, looking every bit like an owl’s eye sitting there. Its interior wing coloration is brilliant blue. So cool. 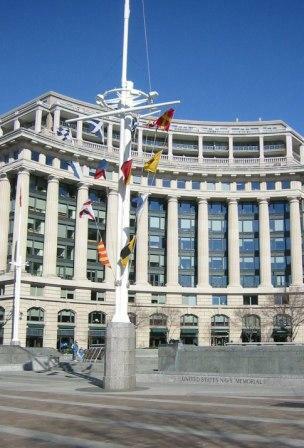 Walking down Pennsylvania one morning, we happened upon the Navy Memorial. My dad was a career Navy man (which in large part explains why three of us four kids were born on Pacific islands), so this was a touching connection for me. Particularly seeing the bronze panel devoted to the “Sea Bees” — the “can-do” Contruction Battalion division that my father was in. botanical gardens. It’s the frustrated gardener in me, I guess. 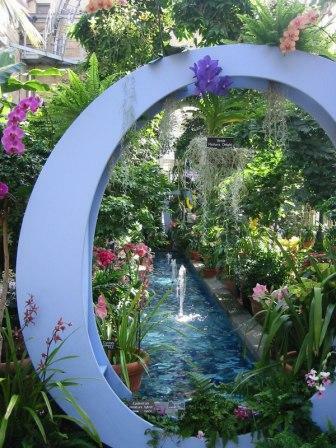 I love seeing lush, colorful, inspiring gardens. (This is one of my all-time favorites, on Kauai.) I was surprised to find that the US Botanic Garden was just steps from the front of the US Capitol. It features an amazing orchid display right now, went nuts shooting many of the flowers. 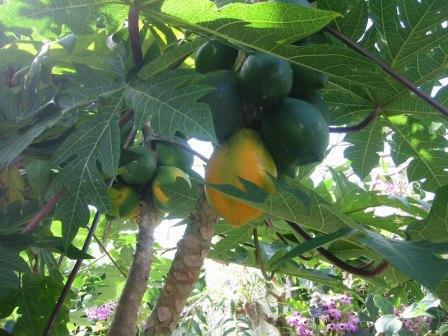 Papayas growing in the botanic garden. I’ve always been jealous of the years my family lived in Hawaii before I was born. Apparently there was a papaya tree in the backyard. I’m still not over it. I don’t really care to live in a tropical climate, but the idea of walking outside to pluck a papaya is mesmerizing. 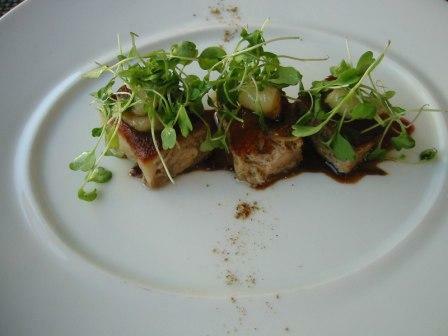 Here’s a sample of our lunch at The Source, a new Wolfgang Puck restaurant in town. It’s connected to the Newseum, a news-focused interactive museum that will be opening April 11. (A cool feature out front is print-outs of that mornings front pages from a newspaper in each of the 50 states, plus a handful of international papers.) Anyway, this lunch started with a plate of Crispy Suckling Pig with Black Plum Puree, Pickled Cipollini and Sweet Bean. Really, really delicious. We stopped in to Zola a couple of times for a drink and a bite. 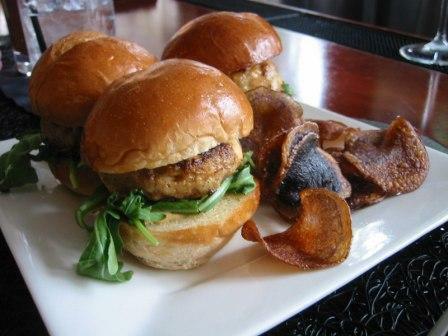 These are their Shrimp and Lobster Sliders from the bar menu. Very tasty. Zola’s next door to The International Spy Museum which we went to one day. Tons of memorabelia, information, background, interviews with former spies, etc. Slick, busy, more commercial than many DC museums, but a fun option for culture of a different kind. This photo barely does justice to this delicious dessert at Central. A most perfect banana split. 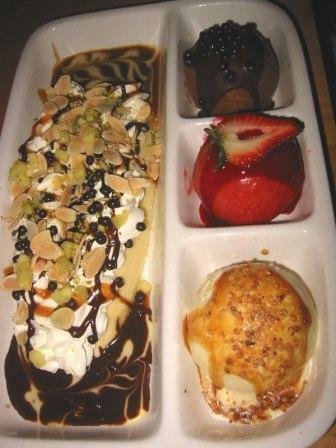 I already can’t wait to return to DC just to have that dessert again. 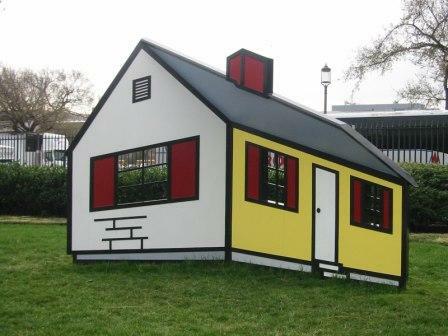 In the National Gallery of Art’s sculpture garden, this was my favorite: an optical illusion of a house created by Roy Lichtenstein, the perspective shifts visually as you move from side to side. 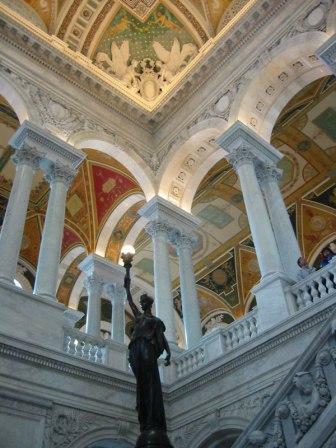 One of many photos I took in the Library of Congress. What a stunning interior, so much craftsmanship, beautiful materials, interesting stories to be told by the figures and designs. The ornateness of every detail–mosaics, columns, lighting, color, statues, inlaid stonework–it was nearly sensory overload. I could have spent another hour or two in there. Lunch at Oyamel on our last day was a treat. I’ll definitely return here for dinner sometime, particularly for a dose of that delicious-looking tableside guacamole they whip up. 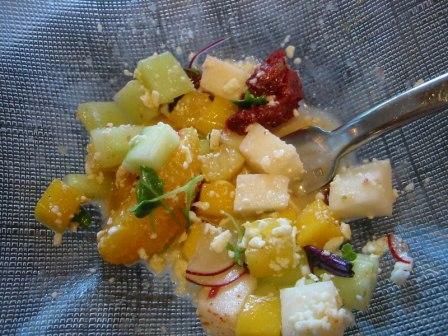 Here’s my “gaspacho estilo Morelia” which is a sort of chunky salad with jicama, mangoes, cucumber, jalapeno and orange. Wonderful. Oh, there are so many more shots to share, bites to recount, museums and other experiences to regale you with. But I simply have to call it a night! There will be other travels, other meals, other adventures to share with you soon enough.